Tall ships visit Port Washington during the Pirate Festival (June 4-6 2010) and the Maritime Festival (August 20-22 2010). The Port Washington marina is a perfect staging area for these popular festivals. Attend one or both of these festivals and make a weekend of it with a stay at the Port Washington Inn on Sweetcake Hill. The above picture was taken from the Top of the World Suite of the inn and depicts a zoomed in view of the art deco lighthouse in the harbor as one of the tall ships take passengers on a cruise and a fishing charter takes off in search of big fish! 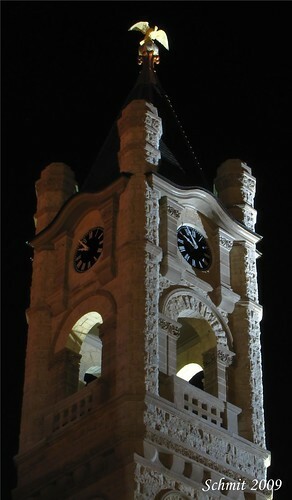 As seen from the Port Washington Inn, the restored clock tower of the original Ozaukee County Courthouse is a landmark framing our views of Lake Michigan. Lighted at night, this landmark is an exquisite example of the impact of architecture on our daily lives.